I might call this Hamilton Beach Electric knife the best thing since sliced bread even if bread is not its intended purpose. This handy, inexpensive electric kitchen knife will make quick, clean and neat work out of roast beef, turkey breast, and other solid cuts of meat. But, believe it or not, one of the best uses I’ve found for an electric carving knife goes beyond this. Imagine trying to slice through bacon-wrapped meatloaf by hand. The bacon would undoubtedly slide right off the meat and the servings would likely not be very equally divided. Also, the downward pressure applied by your hand would squeeze some of the juices right out of the beef. 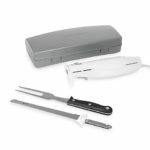 The beauty of the electric carving knife is that the serrated edges of the knife make a very precision-made cut right through the bacon and meat. Very little pressure is needed, meaning that the the bacon and the juice stays on and inside the meat where it belongs. I’ve used the Hamilton Beach Electric Knife on prime rib and turkey breast. While tougher cuts of meat do take a little bit longer and more work than the meat loaf, I still think it is quicker and easier than cutting by hand with a good, sharp carving knife. Since the knife is built for safety, it does require an inward and prolonged push on the power button while applying slight downward pressure. You will find your wrist and hand do get tired after carving through a large portion of meat. One of the beauty’s of this electric knife is simplicity. It consists of two blades which connect to each other and fit inside the base handle. The included, attached cord is sufficiently long enough to use on your kitchen counter tops.. The blades are easy to clean, but be careful handling them. The serrated edges can cut you if you attempt to wipe them off with your hands. Also, never attempt to clean or remove the blades while the unit is plugged in. The entire unit and blades fit inside a little case for easy and convenient storage. I like inexpensive simplicity and convenience. At under $20.00, this electric carving knife hits the mark.